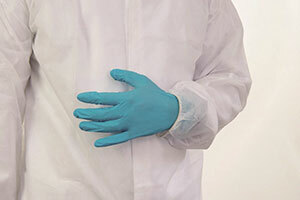 Supertouch has launched a non-woven coat with Velcro fastening collar and elasticated cuffs to provide extra barrier protection for people working in areas where minimising contaminates is of maximum importance. The supplier of PPE and workwear claims that its new non-woven coat is a first on the UK market, with its Velcro fastening top collar and elasticated cuffs. Each coat is individually wrapped making it suitable for applications where hygiene rules apply. Available in sizes S to 4XL, the single use coats come in white as standard & are now available in blue. The coats are made from non-woven polypropylene and are manufactured to comply with EC Council Directive 89/686/EEC to ensure they are of the highest quality for end users and meet the necessary British and European standards for PPE.